K9 Cash’s excels in all three duty categories! Posted February 23rd, 2018 by nocopf-admin & filed under News. I want to say thank you again for sponsoring K9 CASH last year by providing funds to help cover his training costs. 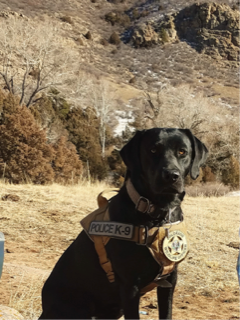 It is hard to believe, but we are coming up on his one-year anniversary as a certified wildlife detection canine with Colorado Parks and Wildlife. During this short time, a variety of duties and tasks were accomplished. K9 CASH’s job duties for 2017 can been divided into three main categories. These included aiding wildlife officers in gaining public compliance with wildlife laws, participating in field surveys in an effort to locate wildlife species of conservation concern and providing educational programs to members of the public to increase awareness of natural resources. Last year, K9 CASH assisted with two hunter check stations in the Silverthorne and Meeker area during big game rifle seasons. He also assisted with the investigations of two separate mule deer poaching incidents where the deer were illegally taken. He used his nose to sniff out the kill sites and locate key evidence for the cases. Six survey days were spent looking for federally endangered black-footed ferrets and Colorado State endangered boreal toads. K9 CASH worked alongside Colorado Parks and Wildlife’s crews to locate and document these species in their natural environments. CASH is proving to be a valuable asset in reaching a variety of groups to educate them on various wildlife topics including the importance of hunting as a wildlife management tool. Many groups that are not traditionally interested in wildlife are showing an added curiosity when the unique topic of wildlife K9 is thrown into the equation. 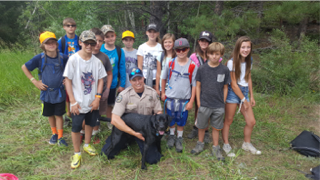 Just last year, over 25 wildlife related K9 talks were presented to groups ranging from youth pheasant hunters, public service clubs, youth outdoor camps and elementary school groups. In January, CASH performed four wildlife K9 demos to audiences at the International Sportsmen Expo.